Porfirio’s honors the best of Mexico by transforming its traditional flavors, textures and aromas into the most polished dishes of the country’s haute cuisine.Immersed into an environment that challenges the concept of tradition, here you will witness the way in which classic ingredients become gracefully mixed until finding the ideal balance that tickles even the most selective palates, bringing intrepid flavors from the remote corners of the vibrant Mexico directly to our guest’s table. In addition, Porfirio’s offers a winery featuring over 100 carefully selected Tequila and Mezcal brands for the perfect pairing.The experience is completed with the exceptional service that has already set us apart. In an atmosphere where music, decoration and flavor mingle and translate into elegance and fine taste. 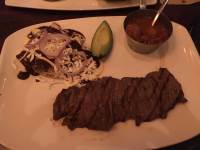 It is hard to find decent Mexican food on the hotel strip in Cancun. So much of the Comida Mexicana here looks and tastes industrial, especially the sides like guacamole and beans. Not so at Porfirio’s. Savor those sides as well as an excellent selection of slow cooked beef ribs (8 hours, in fact), cheese fondue, tortilla soup, or fresh local fish and be comfortable in the fact that the ingredients are top shelf. You might even want to try a boutique mezcal or a “bandera” (an aperitif of sangrita, lime juice and tequila in three separate little glasses representing the colors of the Mexican flag). 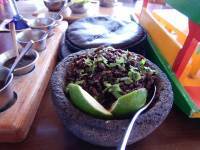 Get a little adventurous and you can have some grasshoppers along with your drink. 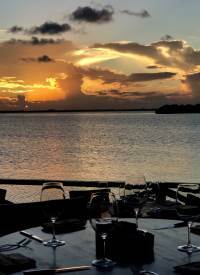 The bar and dining room of the restaurant are flashy and modern in design ( a la Las Vegas) and there is an amazing romantic deck outside with tables overlooking the lagoon. Our waitstaff, Jorge and Eric, were excellent. Attentive without hovering and very knowledgeable about the menu. 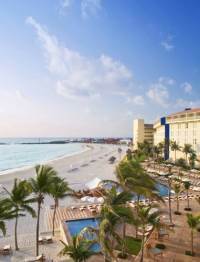 We frequently visit Cancun for long weekend vacations. We primarily stay at the Ritz. In the past we've dined at Lorenzillos, Puerto Madero, and La Distileria. 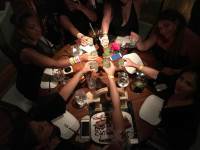 For a fine dining experience we love Fantino but Porfirio's has the top stop for upscale casual. Our entire experience was sublime. 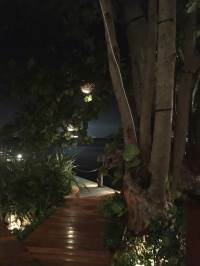 Ambiance - The deck seating under cover with ceiling fans allowed us to enjoy the outside and take in a lagoon view with the comfortable breeze from the fans. They also have several of the sliding glass doors open which allowed the cool air-conditioning from the inside dining room to drift out on the deck as well. 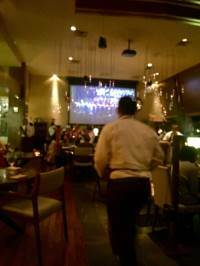 We enjoyed the mid size flat screens that featured popular Latin music videos, the music was low enough to enjoy and still allowed for comfortable conversation and the mix was a perfect blend of pop and slow romantic songs featuring some of my favorites like Luis Miguel and Juan Gabriel. The reverse karaoke was the best! During a Luis Miguel song the Mariachi's snuck in and started playing the tune on the TV's it was great having the live music accompanied by Luis Miguel's vocals on the TV! We loved it. As the Mariachi's strolled around many tables joined in the singing and were obviously having fun. 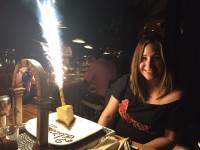 Our table side serenade and sparkler decorated dessert was perfect for celebrating our anniversary. The service was top notch. Our server Ulises was on his game! The manager stopped by our table several times as well to check in. 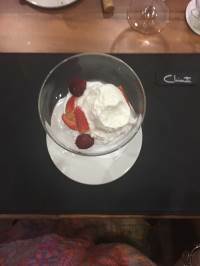 Courses came at a good pace, never felt rushed, Ulises was attentive and empty cocktail glasses and used plates were cleared quickly. 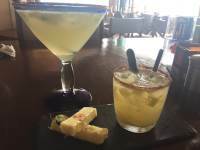 The drinks were fantastic, I enjoyed a Pina Agave which is a pineapple chili infused cocktail that was the perfect blend of sweet and spicy. 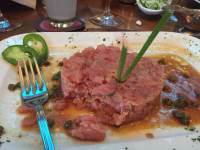 My husband had the Josefina de Tamarindo which was equally as good. 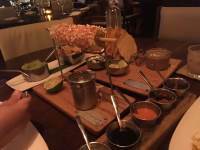 The complimentary appetizers of chili sauces and tostadas were enjoyable as were the elote and guacamole appetizers. We ordered the beef rib for two and were very impressed, it was cooked to perfection, the meat just fell off the bone is was so tender. The presentation was impressive as well. We topped it off with the flan which is some of the best I've ever had. 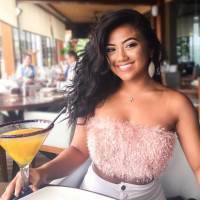 Overall it was easily one of our most enjoyable dining experiences and my husband and I dine out quite often at mostly mid to high end restaurants socially and for business. We like to think we know our restaurants and this one tops our list! 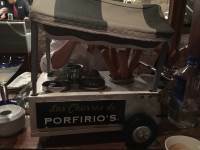 The Hotel concierge recommended Porfirio's and we can't rave enough about our experience. 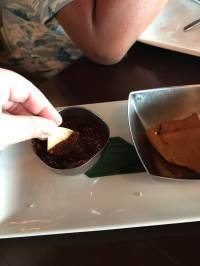 The food was terrific, the live mariachi band was exciting, the child's play room with supervision was totally cool, but the best part was the terrific vibe the restaurant had. 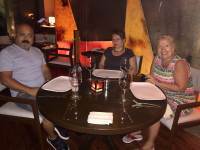 The staff was super friendly and the restaurant manage, Luis Kuri, made sure everything was perfect and spent quality time with us at our table. A must visit!! We will definitely go again (and likely again haha). 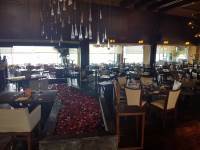 This is an excellent restaurant where the food, ambience, service and scenery blend to provide an unique experience in Cancun. Definitively a must for any trip. Mexican is my favorite cuisine. 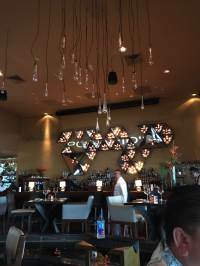 This has been the best dining experience - the manager was wonderful. Food was fantastic! Service was amazing. 5 star experience and worth every single peso and more! Thank you! Great bday celebration for my mom! 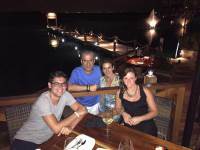 Where can you have a nice dinner with grand parents, parents and kids and ensure a great experience for all? 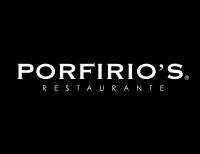 Porfirio's! Gilberto and Toño made sure all of our guest were taken care of. Very attentive!Besides the food and ambiance is great! 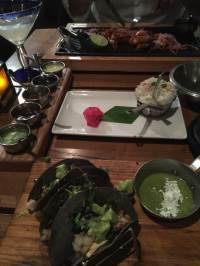 Good for sharing good Mexican dishes, great mezcal cocktails! 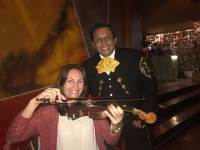 Live mariachis round up the experience! 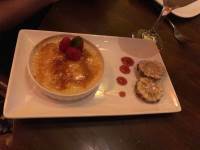 We thoroughly enjoyed our meal at Porfirio’s. 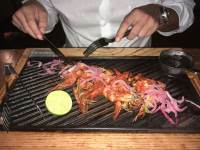 The food was delicious and Enrique and Adan provided excellent service! 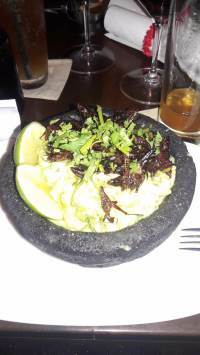 We tried the grasshopper appetizer and a corn appetizer. For the entree we shared enmoladas. We were too full for dessert, sadly because there were several items I wanted to try. 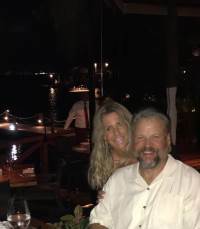 Next time we vacation in Cancun we will definitely eat here again, and I will bring a bigger appetite and save room for dessert! 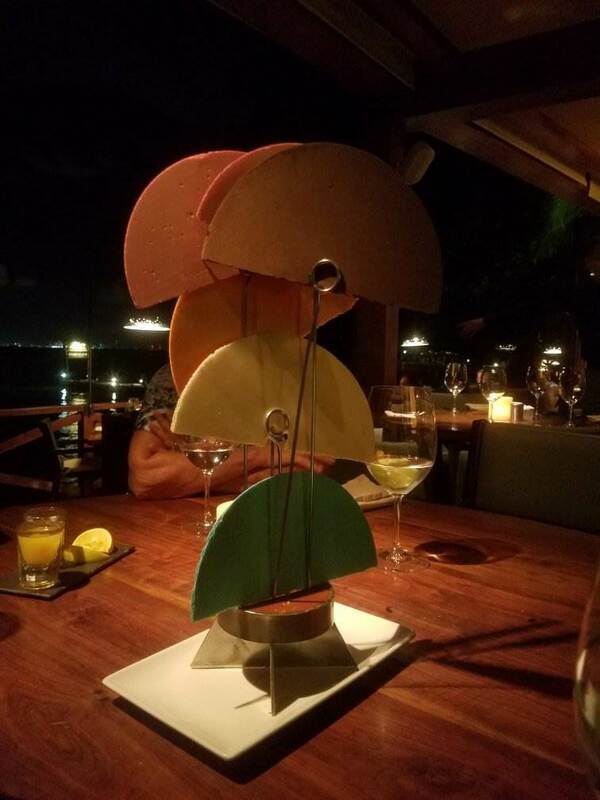 Most unique upscale Mexican food I'd ever eaten. Try the short ribs for 2....absolutely fantastic. Great environment....right on the water. Drinks are fantastic and large. Service is unbelievable.......if you are lucky you'll get Juan Pablo and Fernando. 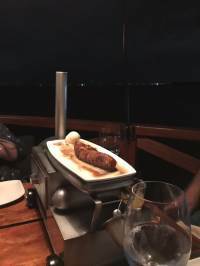 This was a visit to a restaurant that we really enjoyed. 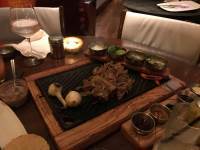 It was like knowing the real flavors of Mexico in a delightful ambientation and food, definitely a good experience. 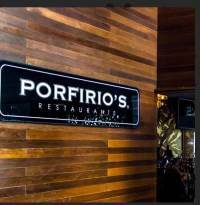 Porfirio's Cancun has a sister restaurant in Mexico City which I have frequented several times and love. 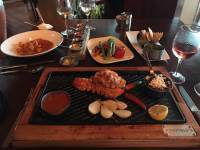 Our experience at this Cancun location was nothing less than perfect! From the moment we walked in, we were greeted by the restaurant managers and every single server on our way to our table. We quickly realized we had sat in a smoking area and they kindly moved us inside to the non smoking area with no hesitation. 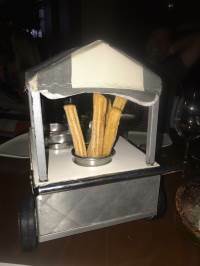 I took my wife and two 13 year old daughters and they were more than impressed with the food, service, and "adorable" (in their own words) presentation of the ice cream cart for dessert. Kudos to the entire staff at this restaurant but especially to Emilio and Luis whom took care of making our experience there an unforgettable one! We had a great time at Porfirios! Its an upbeat place with great food. Service was amazing- thank you to Emilio and Aldo! Food presentation was perfection. 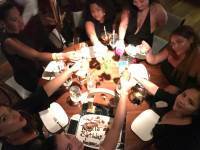 We went to celebrate a birthday during our stay in Cancun and we really enjoyed ourselves. Our friends are vegetarians and they made accommodations for them. 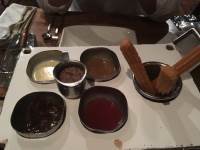 We will definitely return to eat those delicious churros. This place was great! 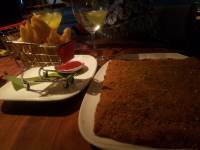 The food was outstanding, the atmosphere was perfect, and our servers, Juan Pablo and Fernando, made us feel right at home. The service was tip notch. Highly recommend! Wonderful experience. 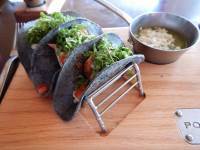 I credible foods of Mexico and intimate atmosphere. Alberto our server explained the history of mezcal, the foods we were ordering and added to our experience. I highly recommend Porfirio's. 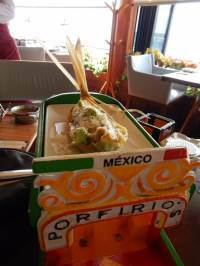 We visited Porfirio's on a Friday evening. Joaguin, our server, took amazing care of us during our visit. Roberto, his helper, was great too. The food was delicious. Be sure to save room for the churro cart. 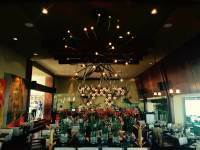 The ambiance in the restaurant was unique; part upscale restaurant, part "hot spot" bar. Highly recommend the chilimango. We skipped the pumpkin seed grasshopper salsa but hey if that's your thing, go for it! 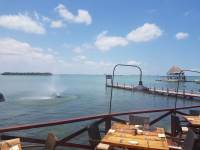 Be sure to ask for an outdoor table to enjoy the beautiful water view. One of the best Mexican resturants i have ever been to. The food is amazing, the way they presented is colurful and creative, but to be honest come here for the service..You will learn how service should be served....Thank You, you made our birthday celebration espectacular!!! !be aware not to have to many tequilas!!!! 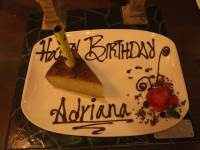 My friend and I went to Portfirio's to celebrate our birthdays and had a wonderful time. 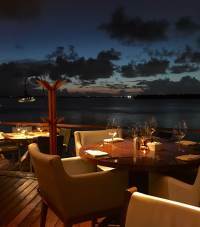 The tables on the water are amazing and the service was fantastic. Jose Fuantes and Nancy were very attentive and provided excellent service and recommendations. 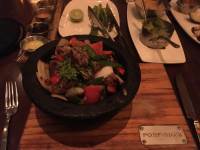 We split a salad for starters and also the molcajete bowl which was delicious. The portions are generous so we had plenty of food.They brought a complimentary corn birthday cake (a traditional Mexican dessert) with a fireworks-type sparkler candle which was fun and festive. The only disappointment was that the mariachi band did not start until 9, and we left by 8 since we were leaving the next day. Overall, it was a wonderful experience. 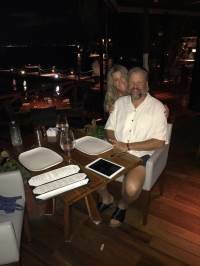 This was the last meal in Cancun on a getaway trip for my husband and me. Unknowingly we definitely saved the best for last. The service we received from our server, Juan Pablo, was the best I have ever had in a restaurant. Not only did he go above and beyond for us, but what he did for the large family with a sleepy toddler beside us really stood out! He made a toddler bed out of extra chairs, placed the toddler down, covered him with a blanket, and patted him until he went to sleep. As a mother of three, I wanted to hug him even though it wasn't my child! We asked him to help us figure out what bottle we should pick out at duty free on our way home, and he gave us the history of and a tasting of Mezcal. The food was delicious. The atmosphere is very chic. I really loved this place. If you go (and you SHOULD!) save room for churros! I hope to go back soon! 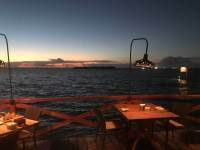 Beautiful restaurant with great atmosphere. Thank you Alberto for outstanding service, along with the manager who answered far too many of our questions about the menu. 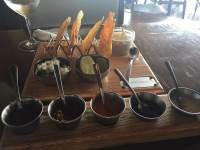 The tostadas and salsas brought before the meal were interesting and delicious. Prices were very reasonable. We loved this place. Perfect for our last evening in town. Great service!! We went without reservations and they got us in within 10 minutes...they were very apologetic that we waited, which was not necessary, but appreciated. We had two great waiters Emilio and Oscar who very attentive and explained the hot sauce tray to us and gave us a warning about which ones were really hot.... The food was excellent and very plentiful. Loved the mariachis too! !The only thing that went wrong, was we wanted to pay by credit card and their wifi wasn't connecting...not a huge deal...thankfully we had the cash. Definitely recommend while visiting Cancun....a very hip spot to visit. Fantastic place from the decor down to the food! Great wait staff, great decor and fabulous food! What a joy to come here! It was a treat and I have never experienced the way that they served the food. It was fun and very out of the ordinary. 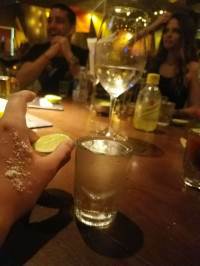 I have nothing bad to say and highly recommend this experience to everyone who visits Cancun! When we walked in I was incredibly nervous because I could tell right away this was a high class restaurant and that was not within our budget. 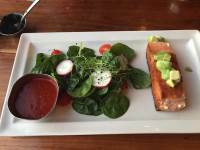 We sat down and got the menu and were pleasantly surprised. Nothing that much more expensive than any typical chain restaurant. Our server was incredible and made us feed like we were fine dining. Highly, highly recommend! We couldn't be happier with the entire experience!!! Excellent authentic food and unparalleled service from Jose and Luis!!! We will come back again and again and again!!! 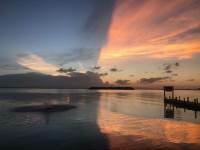 Excellente y exraordinario!!! 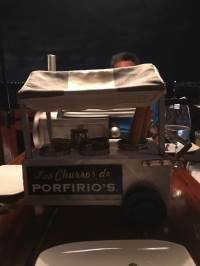 My boyfriend and I recently had dinner at Porfirios on our last evening in Cancun, and I can't recommend it enough. 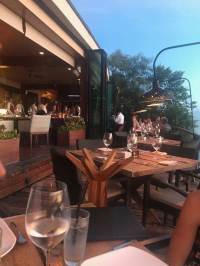 The restaurant itself is gorgeous with a great ambiance inside, and if you sit outside there's a lovely view of the water, so either way you win. Cristian and Daniel took care of us, and I honestly don't think I've ever received better service at a restaurant. They were so attentive, without being intrusive in the least - which is not always an easy feat in my experience. 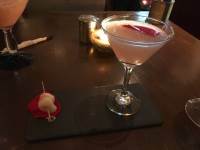 My boyfriend and I agreed that our drinks were also probably some of the best we've ever had - and they were beautifully presented which just made the experience that much better. 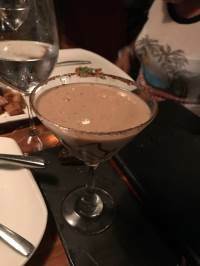 (I had the lychee & rose petal martini which was shaken and poured at the table).There was a complimentary appetizer of tortilla chip rounds with multiple different dips/sauces all of which were unique and fantastic. The portions of the 2 appetizers we ordered (calamari and tuna bits - which were great) were actually fairly generous. 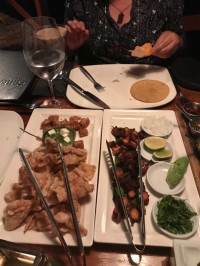 So after all the starters we were worried we wouldn't be able to eat main dishes - but an odd thing about most of the restauraunts we tried in Mexico, including Porfirios, is that some of the main dishes don't include sides. So I ordered the lobster and my boyfriend ordered the catch of the day (grouper) and without ordering sides it ended up being a perfect amount for both of us. I'm admittedly a lobster snob, having spend a lot of time in New England, but the fresh local lobster I had was fantastic and I would highly recommend it. My favorite part of the night though: a DJ was mixing music live, with video projected on a large screen over the bar. (We sat inside). The DJ played a lot of Mexican/Latin American (I hope that's the correct descriptor) songs, old and new, and about every 30 minutes a live mariachi band of at least 6-7 players would come out and play live with the music. The first time they suddenly marched out with the horns blaring, violins, guitars, and bass playing I was stunned - it was just awesome. Each subsequent time they came out I just had to stop eating, and enjoy their playing along with the accompanying video. There were some really epic songs they played - it was truly an experience I won't forget. 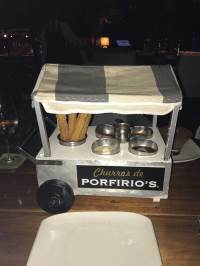 If you're celebrating something special, or you're only going to have one dinner outside your resort in Cancun, the food, drinks, service, and experience at Porfirios can't be beat. My new fave in Cancun! Decided to give this place a try, and boy are we glad we did! 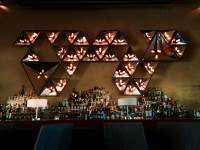 Super fun atmosphere, amazing service, and one of the best Lychee Martini's you will ever have. 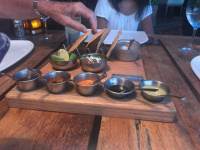 The food was delish and they bring you a tray of like 7 upscale salsa / sauces with full chips while you are waiting. 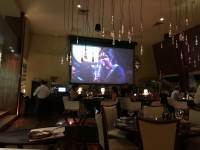 There is a giant screen in the main dining area (the patio area books up like a week in advance, so know that) plays fun clips and music and concert videos which adds to the fun nature of the restaurant, without being overly loud or obnoxious. Well thought-out restaurant and will absolutely go back. If you're staying the Lagunamar you will get 10% off your meal, too. 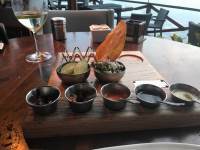 The concierge at our hotel, Westin Lagunamar Ocean Resort Villas & Spas, gave us a recommendation and also made reservations for us. I came with my wife, sister-in law and her husband.We had:ESQUITES DE CARRITO - (3 pieces, actually little cups) Corn Kernels Prepared To Taste: Would have been better grilled as a few reviews mentioned.CAZUELA DE TUÉTANO - (2 pieces, actually served 4 pieces) Grilled Bone Marrow, Chile de Árbol-Jalapeño Sauce, and Homemade Tortilla. One of the best flavored and served bone marrow I've had. The chili and sauce only enhanced the flavor of the marrow. My brother-in-law had never seen this dish before and just raved about how good it was. 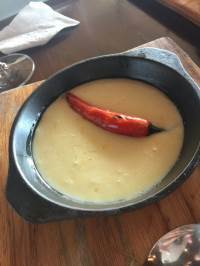 Definitely would order again.QUESO FUNDIDO - Melted Gouda-Swiss Cheese Mix with Flour Tortillas. This was only okay.BURRATA TAMARINDO - Burrata Cheese, Fig, Cherry Tomato, Baby Arugula, Orange, Corn Tortilla Julienne and Tamarind-Chipotle Glaze. This was only okay.TACOS DE RIB EYE - Grilled Rib Eye with Pork Rinds. The rib-eye was so delicious. I could have had more than the three that came with the order. 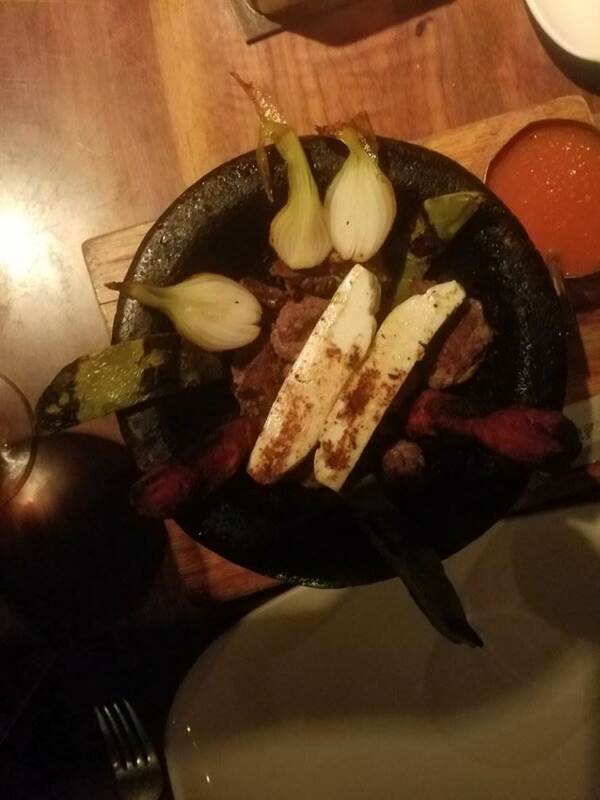 Would order again.MOLCAJETE DE FILETE DE RES - Grilled Tenderloin Served in a Stone Molcajete with Panela Cheese, Mexican Sausage, Onion and Red Sauce. My brother-in-law really enjoyed this dish. 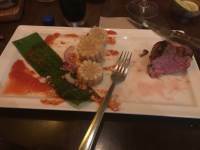 Would order again.FILETE PORFIRIO'S - Grilled Tenderloin with 3 Mini Red Lobster Enchiladasand Grilled Corn. 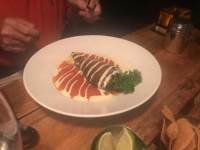 My wife enjoyed the tenderloin but the lobster enchiladas were okay.MOLE TRADICIONAL - Half Chicken in Homemade Mole Sauce. My sister-in-law loved the mole very much. Would order again.We also ordered three deserts, which they don't tell you are huge. And what was over the top was we were celebrating my wife's birthday and my sister-in-law and husbands anniversary so they brought out a Pan de Elote desert which was amazing.DEGUSTACION DE HELADOS - Comes with 4 large scoops of: chocolate, strawberry, dulce de leche and vanilla, including 4 waffle cones and toppings - sprinkles, Oreo cookies, walnuts and sugared nuts. 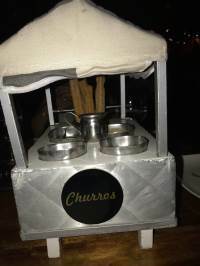 I shared with everyone as there was so much.LOS CHURROS - Comes with sauces: chocolate, strawberry, vanilla, caramel, and hot chocolate. My wife and brother-in-law loved the churros.PLATANO HORNEADO - served with Dulce de Leche. 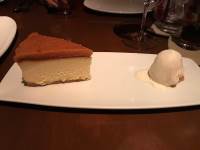 Really couldn't enjoy this desert because there we had so many other deserts. It was delicious though.At the end of the meal and deserts they also serve Pastel: chocolate, strawberry, and vanilla.The restaurant is located by the water; wonderful and intimate. 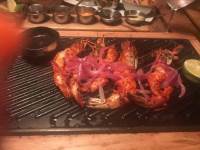 The service was impeccable, Enrique and Armando were absolutely phenomenal. 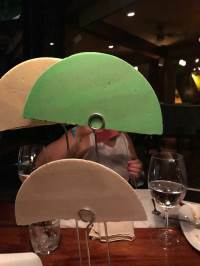 Once you finished a dish all the plates and silverware were cleared and new plates and silverware are set and we didn't have to ask for refills. The food was excellent, everyone agreed this was an amazing meal. If you are looking for a place to celebrate or enjoy an amazing experience. Come here! 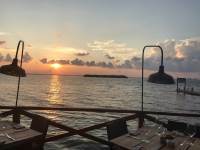 While on my trip for my bday/bacherlotte weekend we stopped by Porfirio for dinner and caught the sunset while we were there. Gilberto & Oscar we’re our waiters and they gave us superb customer service. We were a big group and they made sure we felt comfortable and accommodated all of us. I wanted to get out of the resort for my bday dinner and eat real Mexican food. The food was good but just a bit spicy for me. But then again what can I expect when it is Mexico ?! 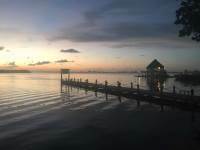 Definitely stop by for a sunset dinner by the water. It’s beautiful, I even caught some fireworks which made it even mor special for my birthday. Thanks so much !! Been here on the 29th Oct eve...showed up with no reservation and we were welcome warmly by all the waiters. All the recommendation on drinks and food from Razzo and Jose were great!! High quality Traditional food served in a very original way!! I have a mexican restaurant in Venice and really look up to a place like this!! Food was amazing and waiters very friendly and nice...I agree with people music is maybe too loud...but that did not surely ruined our dinner!! Thank you guys also for the "private tour" and all the answers to our questions ;)Will recommend it and will come back for sure!! Great job!! 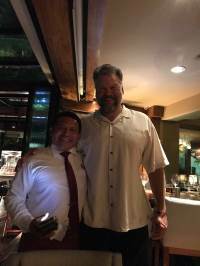 Luis Oscar was our waiter and delivered a 5 star experience, real nice guy with very good knowledge and solid recommendations from the menu. My mother and I celebrated my 21st birthday here (Oct 11). 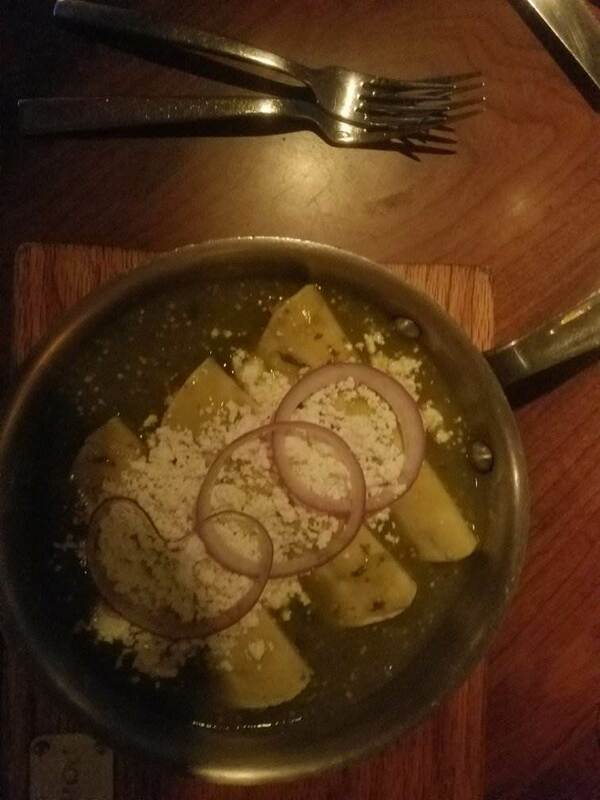 The delivery of our food was so unique, the way they pour the soup in front of you and mix your cocktails at the table. Of course the taste was exquisite. Our waiter ARMANDO was so attentive and funny. 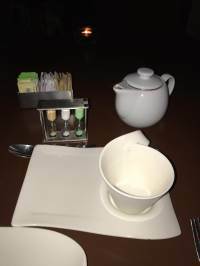 BRAYAN, our busboy was sweet and kept our dining area consistently clear. 10/10 would definitely come back again. They helped me celebrate a milestone birthday that I'll never forget. We enjoyed a great meal, food was excellent. Our waiter was named jose and his assistant juan. They could not have been more attentive. Even management came by. Great time. We had the best time with our servers David and Carlos! 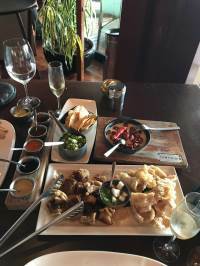 The food was so fantastic we came back twice during our stay! Highly recommend, really awesome!!! 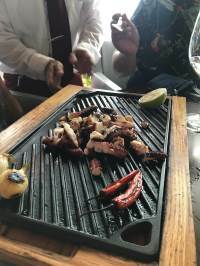 Had a terrific meal and Mezcal tasting and lesson with Juan Pablo and Aldo. 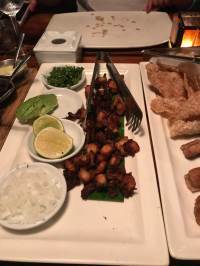 Had the dried grasshopper guacamole (sounds weird, but delish), grilled octopus and spiny lobster. 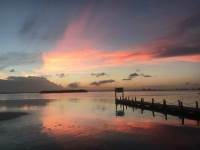 Beautiful setting right on the Gulf of Mexico. Would definitely go back for another meal. A must while in Cancun! 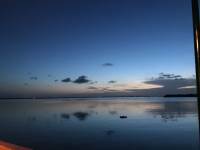 This was an excellent place to visit while vacationing in Cancun. 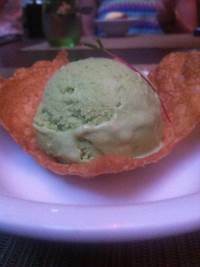 Great flavors, ambiance , price and service. 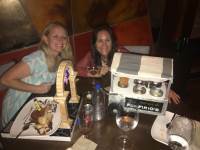 Porfirio's knows food is supposed to be fun! 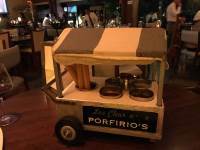 We had a marvelous experience at Porfirio's. We were seated immediately, even though we were fifteen minutes early for oyr reservation. Some staff members from the Ritz-Carlton said we should ask for Alberto, which we did. Alberto took care of us, even though he was working an entirely different area of the restaurant.He gave us lots of great history about Mezcal and helped my wife pick one as a start to our meal. He was also knowledgeable about Mexican wine, and helped us pick a great Casa Madero Shiraz - greatvwine at a wonderful value. 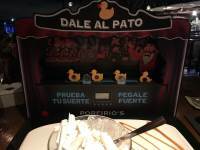 When it xaje to food,Alberto was also able to give us some great recommendations. 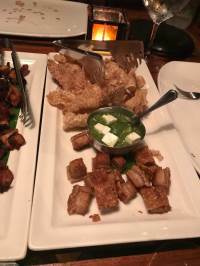 As an appetizer, we got Tacos Canasta, which was eight taquitos of various types - chicharron, chicken in marinade, bean, and potato. 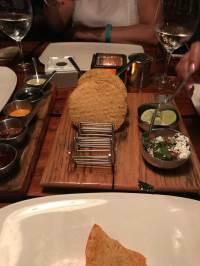 They were very flavorful, but it was the presentation that was remarkable - they dame in a basket that looked like a Mexican food cart! They were a fun andvdelicious way to start.My wife got grilled tuna served with blackened mangos. The yellowtail was a perfect meedium rare, with a wonderful mild flavor. I got the Resort Ribbon, which is a beef short rib slow-cooked for eight hours. The beef is served with cilantro, lime, onion, and avocado, along with corn tortillas to make tacos. After one taco, I just mixed the ingredients on the plate and ate them. The portion was substantial.We shared a platano horneado, which is a roasted banana with brown sugar, caramel, and dulce le leche ice cream. To die for! 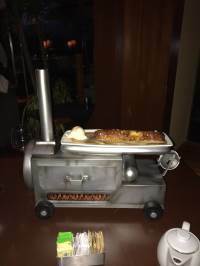 And the presentation was fabulous - the dessert came out on a miniature portable oven, harkening back to the street food heritage of the dish.These guys understand that food is supposed to be fun. 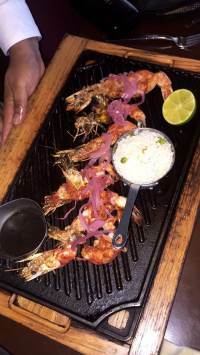 The service by Alberto and his partner Jose, was fantastic.We xant wait to come back yo Cancun and eat gere again! We ate here one night because honestly, we wanted to splurge. Glad we did, makes for a perfect date night, romantic, and great music at 7:30pm local time with trumpets, horns, people marching, etc. You will need a reservation or else they make you sit at a bar table, which was fine for us. But the wall facing the Harbor completely opens up, and you get awesome harbor breezes flowing through the restaurant, which I've never experienced at a fine dining place like this before. Great place to eat for a special occasion or if you like to be waited on hand and foot. The six of us had different ideas on quality of food. Some were very good with a couple not being anything special. 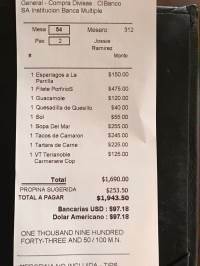 Cost is a little high but this is a good place to try while in Cancun. My husband & I️ visited here on a tip from the concierge at the JW. It was just a short walk from hotel, although we might have grabbed a bus on the way home. We had reservations, and we seated immediately. We ordered drinks and an appetizer, and were promptly served. (After returning home, we heard reports of “bad” alcohol at this restaurant, but I️ can’t say for sure either way. )We both had beer, and we ordered the queso for the appetizer. Amazing, and I️ highly recommend, although please don’t expect American queso. Very festive atmosphere, with a mariachi band going the entire time. After dinner, we had some tequila at the bar.Great service and very good food. Highly recommend, and would return if we go back. Good, but only memorable for two things. 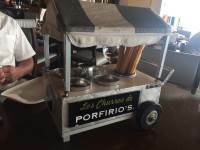 Porfirio's has an extensive menu focusing on Mexican dishes and most people should find numerous appealing options. 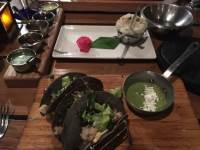 I had the stuffed poblano pepper, which was very good, and my wife had shrimp tacos which were good but nothing special. Most of the others in our group of 8 had fish dishes of several varieties and preparation. Everyone thought they were fine, with nice flavors and interesting presentations. So far, a good restaurant but undistinguished. Now for the memorable parts. 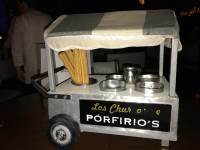 First are two of the desserts we ordered - a variety of ice creams and toppings served in a small replica ice cream cart placed on the table and churros served with a few different sauces in a similar cart. They tasted fine but the table became overloaded with the apparatus used to serve them and we all had to stand up to see what was in the small compartments and serve ourselves. 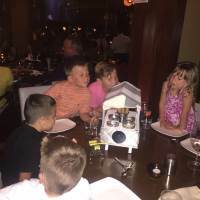 I guess they were trying to create some fun but it was suited more to a kid's restaurant than one that sees itself as upscale. The second memorable part was the mariachi music. It was so loud that conversation at the table was all but impossible. And it wasn't even live; it was played on large flat screens and pumped through speakers powerful enough to enjoy a rock concert. There is a line between loud enough to create excitement while dining and too loud to enjoy conversation with your tablemates. 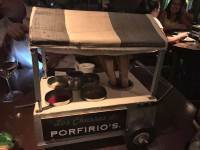 In my opinion, Porfirio's not only crossed that line, they stomped on it until it was totally obliterated. 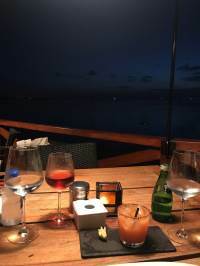 On the positive side, the service was excellent, the view over the lagoon very appealing, and the bill was reasonable. Will we go back? Maybe, but it certainly won't be at the top of our list. 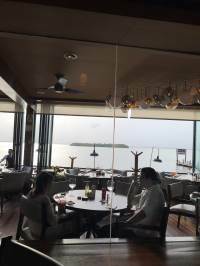 The restaurant is on a great spot with beautiful views over the water. 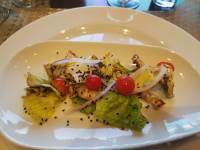 It is fantastically well decorated and laid out and has a warm and welcoming atmosphere.The meal though was disappointing. The complimentary appetizer of chips and a vast array of sauces was definitely more show that taste. 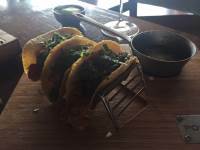 The taco appetizers ordered with chorizo and chicken were neither soft or crispy. They lingered in between and were not that good.We asked for some sour cream and were served cream - not good.For mains the recommended special calamari was over cooked although tender and generous in portion. The chicken enchilada verdes was frankly unpleasant. 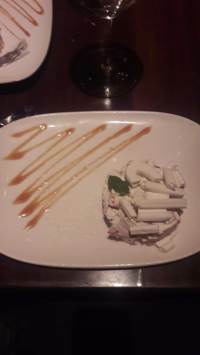 The green tomato sauce was far to runny, the shredded chicken tasted stale and not nice.They tried hard to please, good service and the dishes placed on plates that themselves were decorated and looked amazing.So a mismatch, looks good but food very much below par. I think maybe a better bet would be to stick with basic steaks and seafood but that's a guess. We booked this a while ago before we arrived after reading the reviews here. Easy to get to by bus. The building is great with huge glass doors. There is a greeter outside and we got to choose where to sit so we went outside. This was going to be a good night.. The servers introduced themselves and we choose our drinks. 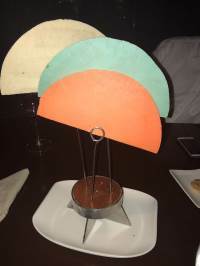 Then the complementary crispy tortillas arrived with the chilli salsas which were a nice touch. 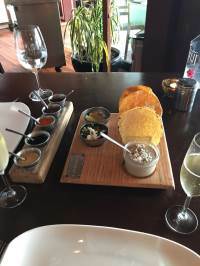 We choose a starter which arrived as soon as we finished the last tortillas literally. Then the minute we put down our cutlery that got taken away and from then it went downhill. We felt so rushed and then I noticed the table next to me had the same service. Was it that they wanted the tables? The main arrived quickly too. I choose the tenderloin with 3 enchiladas with lobster. The meat still had blood combining out so not rested and the 3 enchiladas were lukewarm at best. My OH had the slow roast short rib which was pleasant enough but not much flavour. As we'd eaten so quick we couldn't finish it and it just started to rain to we decided to knock it on the head and go. Disappointed as we were so looking forward to this. Maybe we just picked the wrong night. 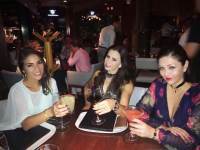 The night before we ate at an Argentinian steak house and had the most amazing food and service and wine for the same price. We've had better food at L'isla shopping mall. Maybe we will try it again. Went with my girlfriend last February and we liked it a lot. This time our experience was a bit disappointing. I admit the food is good. We like the atmosphere but it's a bit too loud for conversation. The night we went we simply wanted three tacos each. The waiter went on to recommend their house special for both of us. To make a long story short, it was enough food for four people and it was quite expensive. 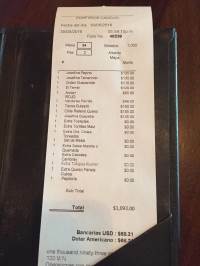 The food with two margaritas came to a little over $100. I don't have a problem spending the money. But we left enough food for two more people to eat. Maybe it's my fault for not asking the price. But in all honesty that was simply too much food for two and I'm over 300 lbs. The waiter was very good and accommodating. And while the food was good, i just felt a bit put off that it wasn't explained better. I probably wouldn't go back with all the options available. Recommended by the Ritz Carleton concierge as a good spot for local cuisine, Porfirio's was a huge disappointment.Outdoor patio seating could have been very nice, with some relaxing dinner music..too bad that they felt the need to blare MTV dance music across the entirety of the room. Didn't need 1980's Madonna at 8pm in the evening. Food was served lukewarm and the steak ordered came under cooked and was cold, as were the lobster enchiladas. 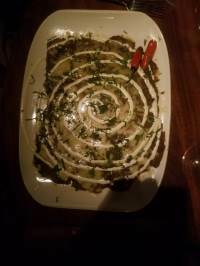 This "signature" house dish came with small corn hunks that where inedible.My wife's salmon tacos were fair, but also cold on arrival. What looked like what could be a good place from the outside quickly fell apart. I would not recommend.